Finelcity makes The Shortlist at Kempton today with an excellent score of 13, having four sections of green and one of amber. On the face of it, the race looks an extremely competitive handicap over a mile, but Finelcity does look well suited to the race based on this. When taking a look at the Full Form filter for Finelcity, we can see that he has raced solely at Kempton since last summer, and has enjoyed a good run with three wins and a second place in his last eight races. He has been a little below par in his last couple of races but is only a pound heavier than for his last victory and the step back up to a mile may help. He has won over distances from seven to nine furlongs and I think the slightly slower pace may help him. Jim Crowley takes the ride on Finelcity back from Hector Crouch today and he has been among the winners recently. Over the past month, he has a strike rate of 21.36% and an Impact Value of 202, meaning he is more than twice as likely than average to have the winner. 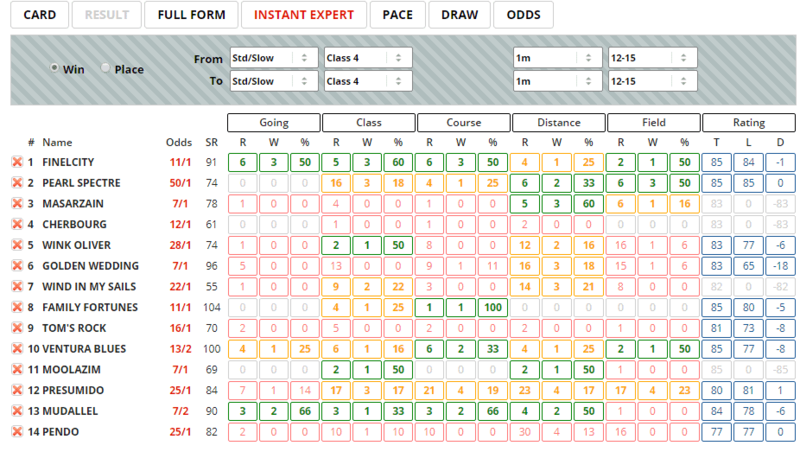 The Instant Expert report confirms the good showing of Finelcity and also shows that there aren't too many other runners in this race that are particularly well suited by today's conditions. One of the runners that are, however, is Mudallel. He is the current 7/2 favourite and has four sections of green. The Pace report shows that early leaders here over this distance have the best record, with almost 14% of them going on to win the race, and this has produced an Impact Value of 1.43. Finelcity is a confirmed front-runner and this is a race that doesn't appear to have a lot of pace in it, especially amongst the low-drawn numbers where he is drawn (stall four). If Crowley can get away well he shouldn't have too much trouble getting to the front where he will hopefully be able to dictate the pace of the race. In this case, I would be hopeful of him having a good chance of getting a place, and at 11/1 I think Finelcity offers a little bit of value in a tricky contest. 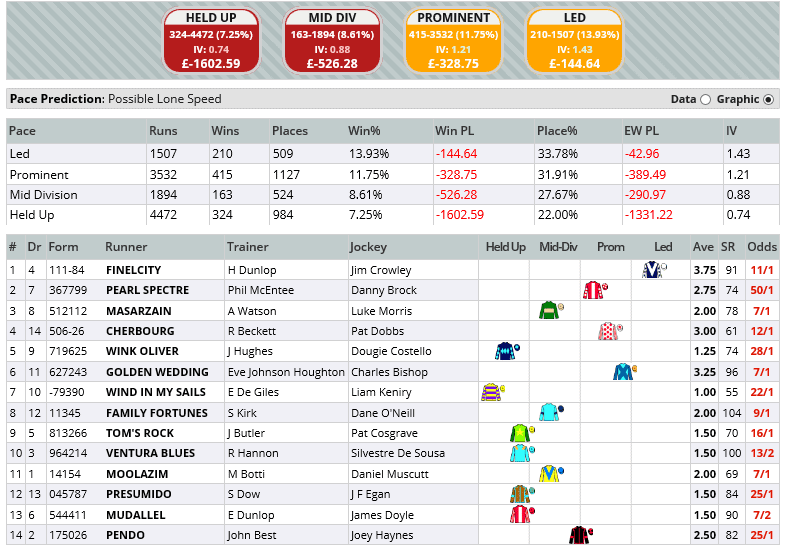 Click here for the 17:05 at Kempton.